I don’t know why but there are very few survival books and websites that you teach you how to select a landing zone and guide in a helicopter. Most of them only teach you how to signal an aircraft for help, you need a mechanic, your radio is broke, don't land here or some other worthless BS hand & arm signal. What’s the matter with all you survival experts & gurus, don’t ya think it’s important to know how to select an LZ / PZ and guide a chopper in? Or do you think all helicopter pilots can figure it out for themselves from the air if they can land somewhere or not? No problem, I don't mind talking about this topic. 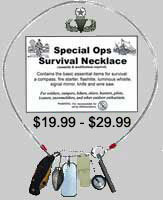 That's why I developed this site, to teach others what your survival books and websites don’t teach and so read on. Regardless of where you're lost or stranded, in the desert, jungle, forest or some winter wonderland. As a general rule all small and medium single rotorary helicopters need approximately 20 x 75 yards/meters of clear, flat land. And lot more than this if a helicopter pilot wants to try to land his aircraft at night in some unfamilar terrain. And the ground must be firm so the helicopter won’t get bogged down nor create a nasty rotor wash that could kick up a lot of sand, dust, debri or snow that could possibly damage the rotor blades or turbine engines. Not to mention, causing the pilot to lose visual contact with you too that could turn into a nasty head decapitation accident. If the ground slope is greater than 15 degrees a helicopter pilot will normally not attempt to land his aircraft on that particular ground. If the ground slope is less than 7 degrees the pilot will most likely attempt to land his aircraft facing “upslope.” And if the ground slope is between 7 - 15 degrees he will attempt to land his aircraft sideways or “sideslope.” But if the ground slope is greater than 15 degrees, he will probably chose to just “hover” above the ground and not land at all, depends on his flying. Generally when a helicopter pilot approaches and takes off from a landing zone they will always try to fly their aircraft facing into the wind for better lift and control. However, if there is only one decent approuch in & out of the landing zone, a helicopter pilots can handle “crosswinds” up to 10 knots/mph or “tailwinds” up to 5 knot/mph. Of the two factors – approach & departure and prevailing winds, the best approach & departure route is the most important factor unless crosswinds exceed 10 knots/mph and tailwinds exceed 5 knots/mph. But the ability to land & take off downwind will depend on the type of aircraft as smaller helicopters can accept less crosswinds or tailwinds than larger helicopters. Though lightly loaded small & medium size helicopters can ascend and descend “vertically,” large and heavy helicopters cannot hover, ascend nor descend vertically very well. When it comes to tall obstacles near or around landing zones like tall trees, power lines, etc. For planning purposes and to make sure a helicopter has enough room to fly over it when landing or taking off, always use the "10-1 obstacle clearance formula." For example, for a helicopter to clear a 10 yard tall tree at the end of a landing zone (LZ) when approaching or taking off you mulitiply the height of the tree (10 yards) x 10 which comes out to a 100 yards of flight clearance needed to fly over the tree(s). Got it? 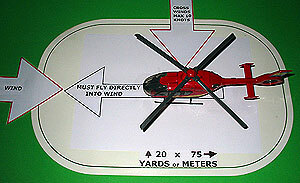 WARNING: When a helicopter lands (a) never approuch it nor walk around it to the rear, (b) always approach it either from the left front or right front so the pilot and or co-pilot can see you coming, (c) keep your head and body as low to the ground as possible to avoid being decapitated and (d) once you are inside the helicopter keep your seat belt fastened until the aircraft has landed safely. Whenever an aircraft goes out searching whether it's to look for one person, several people, a vehicle, plane, boat, etc. The SAR team and pilot will decide which search pattern to use based on the terrain, weather and or the width & length of the body of water whether it's a river, lake or ocean. Though there are six basic aerial search patterns, the fan, the track crawl, the square search and water course search. The most common aerial search patterns used are these two in the photo called the "creeping line" and the "contour line" search. Regardless of the search pattern used a pilot will usually pass over an area "almost twice" [as seen in the above photo] before moving on to another section of land or body of water. So in other words, should you hear or see an aircraft approuching you will have "almost" two chances to signal it for help before it moves on and out of the area. So if you snooze and wait too long to signal it for help you could lose your only chance of being spotted, found and rescued. And when an aircraft has spotted you, don't worry they will let you know. How? If it's helicopter the pilot will usually hover above your location letting you know you've been spotted. If it's a fixed wing aircraft (an airplane) the pilot will usually dip it's wings right & left several times to let you know "Gotcha, don't worry, I see where you are located." And if a plane or helicopter does not see you it will be obvious as they will continue to fly over and pass you. But if a plane continues to circle above, it could mean they saw you and they are trying determine if you are still alive and waiting on you to give them some type of a signal back, such as these hand & arm and body signals below.